When we think of meat stews, we often remember the boring and greasy stews of our childhood school dinners, but around the world there are fantastic recipes for tasty and nutritious stews that are fit to be served in the finest restaurants. Here are two recipes that will ring the changes on meat stew and have your family asking for more! The term Guisado means sautéed with garlic, onions and tomatoes and a guisado is a rich slow-cooked stew, usually made with beef and served with a side dish of rice. 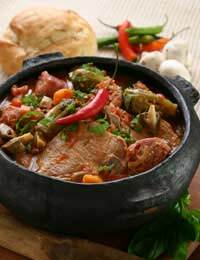 A guisado can also be made with lamb and the quantities and kinds of vegetables it contains can be adapted, as long as you remember to stick with the four key ingredients: meat, garlic, onions and tomatoes. Heat a little oil in a frying pan and brown the meat. Set the meat aside and use the rest of the oil to fry the onions until they are transparent, then add the garlic.After five minutes of cooking add the tomatoes and cook for a few minute before transferring the vegetables to a slow cooker and pouring the beef stock over them. Arrange the meat on top with a little seasoning. Cook for 3 hours or until the beef is tender. Use 250 g of diced lamb and the same amount of French beans which should be cut to a comfortable fork length. Vegetable stock can replace beef stock. Carry out the method above, but an hour before the end of cooking add the beans so that they retain a little crunchiness when the dish is served. Goulash, also called gulyas, means cowboy. It’s a dish that was traditionally cooked by men out guarding stock, and they would prepare it over an open fire. It can be cooked with either pork or beef and the essential ingredient is paprika which gives it a smoky taste and an unmistakable smell. It is best served with wide noodles or plain boiled potatoes. Fry the onions in the olive oil until they are golden and soft, then seed and chop the chilli and add it to the onions with the paprika. Take these ingredients from the pan and set aside while you brown the meat, then return the onions to the pan and sprinkle the mixture with flour, turning it so that the flour is spread through the mixture. Pour in the mushrooms and the water they have been steeping in, and while that comes to a simmer, slice the peppers and stir them, along with the tomatoes, caraway seeds and the rest of the stock into the mixture. Ensure it is all simmering before pouring into the slow cooker for five hours. After five hours, skim the dish to remove any floating fat (this is not necessary with beef) and pour the sour cream in an attractive spiral over the surface before taking the cooker to the table to serve over potatoes or noodles.